According to reports, over 150 people have died in India from an epidemic of dengue fever. No doubt, the death toll will have risen by the time you read this blog post. Dengue fever results from a virus spread by a mosquito (Aedes aegypti). Interestingly, there is a discussion going on in India over one of the alleged treatments for dengue fever called Nilavembu, which is a combination of herbs. Dengue fever is easily mistaken for the common flu (influenza). Dengue fever can cause high fever, chills, headache, swollen glands, nausea, vomiting, aches and pains of the muscles and joints, fatigue, a rash, bruising, and so on. Dengue fever can progress in severity until it kills you. Dengue fever can turn into dengue hemorrhagic fever, which can cause severe bleeding. It’s a horrible death. Naturally, anyone near an outbreak would want a medication to prevent or cure dengue fever. What do medical studies say? 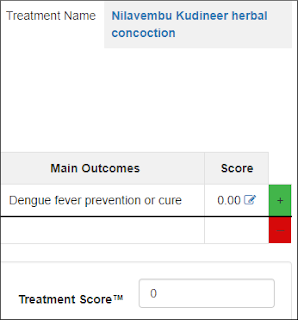 I searched the medical literature on treating dengue fever with the herbal preparation Nilavembu Kudineer, added them up, and came up with a Treatment Score of zero. Zero in this case meaning there is no data. I could not find any studies with human beings that gave treatment effects showing Nilavaembu Kudineer to be effective at either treating or preventing dengue fever. The graphic shows the final result. In the software, you can click through the graphic to get all the original data. To come up with the Treatment Score, I searched PubMed (https://www.ncbi.nlm.nih.gov/pubmed/) and only found two medical studies on Nilavembu. One study was in mice, and one study was "in silico," which means a laboratory study using computers that have silicon chips. There were no human studies. I also search the medical literature via the Trip Database (https://www.tripdatabase.com) and found zero studies of "quality" for Nilavembu. In addition, I searched Google Scholar, and while finding some interesting non-human studies, I found no human studies. If anyone knows of any important HUMAN studies on Nilavembu, please let me know. There may be studies in Indian medical journals to which I do not have access. Please review and critique this review, and suggest other studies that need to be considered. One good quality study would change the Treatment Score. I would love to collaborate. Let’s work together. Ideally, quintuple blinded, randomized controlled trials need to be done comparing the Nilavembu Kudineer herbal concoction with placebo. It would be great if Kamal Haasan collaborated with the government to get studies done. If Nilavembu Kudineer proved to be effective in randomized controlled trials at either prevention or cure of dengue fever it would be a major discovery. Sometimes herbal therapies hold up in experimental studies. We all need to know, because science is how new and better treatments are discovered. Patients, doctors, nurses, and journalists around the world need to start working together to create better treatment transparency. We all need to be better science communicators. We can do this using Treatment Scores. 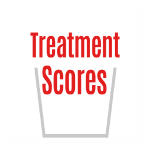 The Treatment Score = the net treatment benefit for the patient, as summarized from the existing medical literature. One of the problems with studying herbal preparations is that they often have many names and different ingredients. This means they often have different doses of the different ingredients. For example, Nilavembu Kudineer may also be called Nilavembu Kashayam, or Nilavembu Kudineer Choornam (Churna). It’s not entirely clear. When I calculated the Treatment Score for Nilavembu Kudineer, I could not find any statistics for the side effects. Specifically, I found no “event rates” for any side effects. These studies need to be done, if they have not been done. The side effect of infertility is interesting, because it may not be a side effect at all, but may possibly be an Internet rumor - another reason why high quality studies are needed.